Day 29: Do you want to write an outline? Story and setting. We’ve covered a lot of major topics in the last month, but how do we combine these disparate story ingredients into a recipe for a novel? Others, typically called “plotters,” appreciate having the rudder of an outline to help them steer through the torrent of uncertainty that is a blank page. (I wonder if this has anything to do with being a worrier or a warrior?) If you do better with more of a plan (or are willing to give it a try), writing an outline might be a good thing for you. Action Plan: If you’re already a tried and true pantser, keep thinking about your novel or trying out your writing routine, and add to your notes whenever a new idea strikes you. If you haven’t done NaNo before—or you think you might like the ability to jump around your story instead of writing it in order—try crafting an outline. It can be relatively broad or super detailed depending on how much time or thought you want to devote to it. 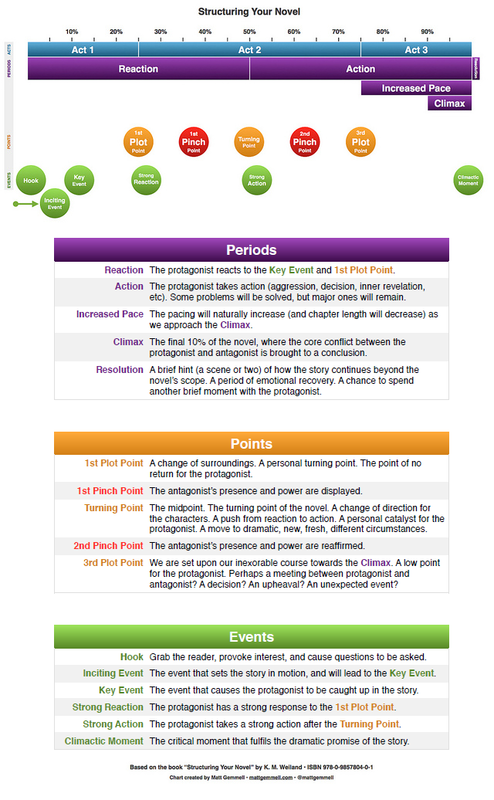 Find an outline template or story structure framework and begin translating the generic story beats/plot milestones into scenes specific to your story and protagonist. Alternatively, make your own outline skeleton by dividing your story up into three or five parts. Figure out milestones that divide the plot, such as moments where the protagonist or antagonist achieve major components of their overall goal. Slot in the essential scenes (see Day 14) you’ve been cultivating as well as the inciting incident (Day 12), key event (Day 13), and darkest moment (Day 26). Brainstorm ways that the protagonist would progress from scene to scene, their actions and the consequences, adding in additional scenes where necessary. Generally speaking, you don’t need a scene unless your protagonist goes up against an obstacle—or has a decision to make—and progress toward their conscious/subconscious desire is made or lost. So don’t be shy about adding sources of tension, whether they’re internal or external!